Oops, forgot I went fishing again. Went out last Saturday morning to try and stock the freezer some more before winter sets in. Since the temps bottomed out last week and we saw our first snow flakes, winter could come sooner than expected. Surface water temps were around 52 degrees and there were no surface weeds to deal with. There were plenty below the surface though and I had to check lines on a regular basis. I started fishing around 7:00 am and packed it in around 10:00 am. Not much to report other than it was cold out. 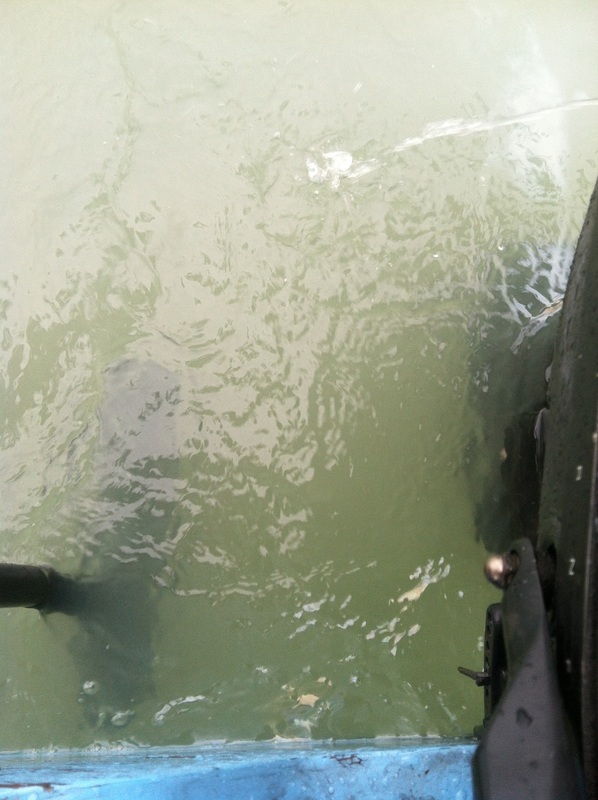 One other boat was out trolling along the Edison Discharge and I saw him catch a couple of fish. No signs of any gizzard shad yet. I’ll try again this weekend. September is an odd month. 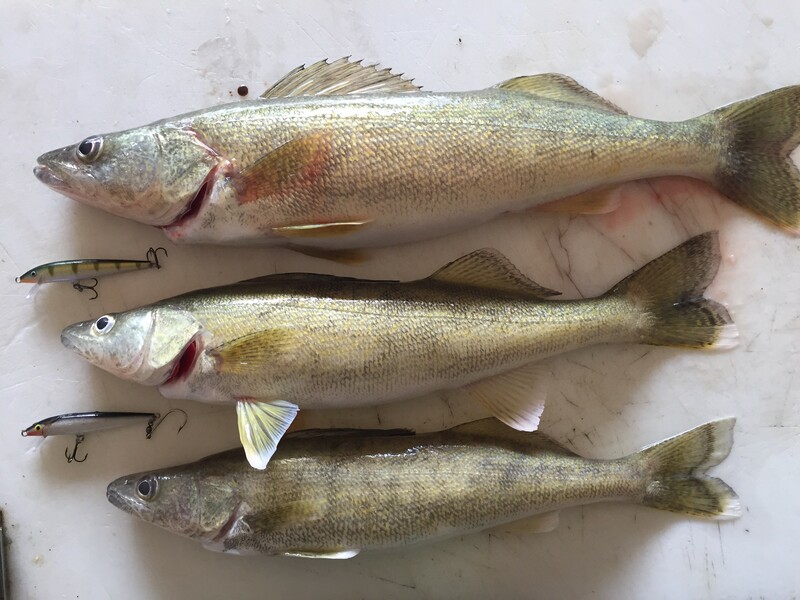 Walleye fishing can be very hit and miss as the fish start to transition form their summer feeding patterns to their fall/winter pattern. I have had more days where I come up empty handed in September than any other month. This never bothers me because I am actually thinking more about small game hunting than I am thinking about fishing. I still got out, except this year with my boat being down, but it is not as frequent. I’m kind of in a holding pattern until the water temps get down to that 50 degree range. Getting there can take awhile or it can happen in a week, it all depends on the weather. When I do go I experiment more with lure selection this time than any other. By now the lower river is full of yoy smallmouth bass and the emerald shiners are stilla round and they are bigger as well. 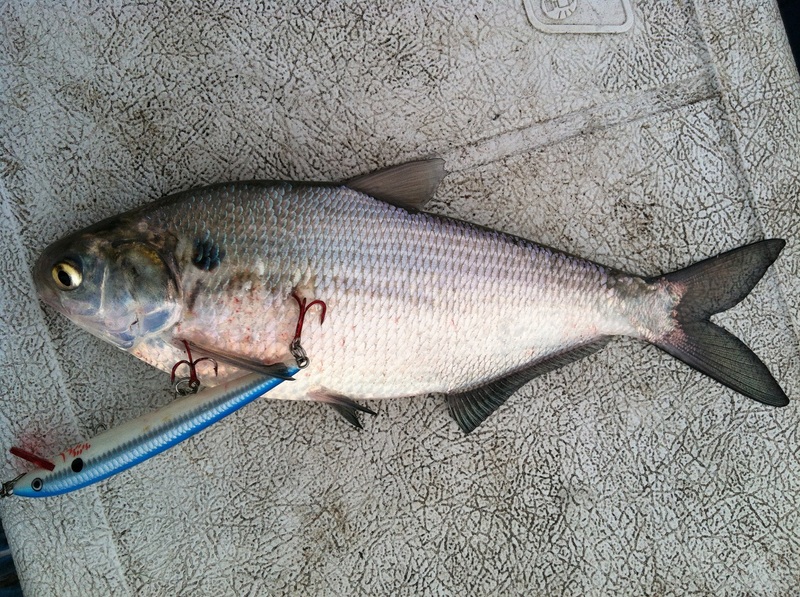 Some Gizzard Shad may have started to show up but the bigger run is still months away. Knowing all this I will run everything from #13 to #5 Rapala’s and spoons. It all depends on what is most abundant. I pay particular attention to the warm water discharge to see what is jumping and just how many crane’s, herons and eagles are in the area. If I see lots of minnows I’m sticking to the smaller size lures in natural colors, especially if the water is still clear, which it usually is. If some shad are in though out go the #11 and #13 Rapala’s. I usually hold off on the bigger lures until October when it is colder but you never know. I don’t waste a lot of time dragging the same bait around. If it’s not producing in the first half and hour it is getting replaced. I mean I really play around now. Different sizes, styles, colors, action, speed….anything to try and trigger a strike. Now it could just be that their aren’t any fish in the area. The smaller ones that were around all summer may have moved back out to the lake and the bigger fish haven’t moved in yet. I don’t know for sure. I don’t have any tracking beacons on the fish. I do wish I could get access to all the movement data on the walleye swimming around with the radio transmitters in them. THAT WOULD BE AWESOME!!!!! Since I don’t I just have to keep trying and hope that it gets better in October. Either that or I just go out and shoot squirrels which most years is more productive. Polar Vortex. Who comes up with this crap? When I was younger and it was cold out it was just that, cold out. Now they have to give it a name, what ever happened to just saying it is colder than a witch’s left…..well you know. One thing this cold has done is give me a serious case of fishing withdrawal and the colder it gets the worse it gets. My original plan was to do a little Steelhead fishing on the Huron and AuSable River. Last time I checked most of the Huron from the mouth on up was frozen or there was so much shelf ice that fishing was darn near impossible. The AuSable isn’t much better. I go out and buy a new fishing rod and take the time to tie up a bunch of fancy jigs and all I can do is stare at both of them. There is a silver lining to all of this and it has to do with the water levels. During our last cold spell when we all about froze are butts off (see, isn’t that better than Polar Vortex?) meteorologists made a few comments about the Great Lakes. I read that it is estimated that up to 60% of the Great Lakes could freeze this winter. This would help prevent evaporation and keep the water levels from dropping like they have during our previous mild winters. I’m all for that, water levels were getting so low that boat launching was problematic at some ramps, especially with any type of a west wind. Hopefully northern Ontario is getting record snow falls like we are as well. Of course if this does keep up the ice will still be flowing downstream in April. So I guess I have to pick my poison, early fishing or long term relief? I’ll take long term relief. Of course this extreme cold and deep snow is going to have other affects both good and bad. A major freeze like this will kill off the gizzard shad which area known predator of walleye fry. 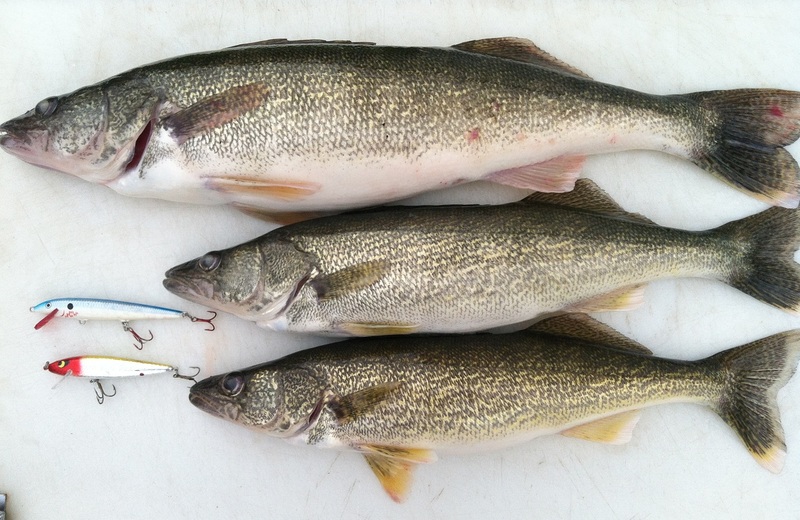 Of course they are a food source for adult walleye as well. To bad the freeze doesn’t have the same effect on White Bass. The deer herd is going to take a beating if this keeps up. This will make the farmers and AAA happy but the deer hunters and the industry that supply’s them won’t be so thrilled. Those guys seem to have enough to complain about it as it is, they really don’t need anything else. I also read that the Straits of Mackinac froze over, here come the wolves. I’m kind of on the fence on this. I have no desire to hunt a wolf but I believe that the numbers have to be kept in check. It would be cool to see one in the wild but I am not a farmer who has to worry about his cows disappearing. Their control should be left up to the DNR not the general, uneducated public. The ice fishermen should be loving this. They haven’t been able to get out on to Brest Bay the last couple of years but they can this year. What really cracks me up though is all the bitchin’ I hear in the Spring about guys keeping female walleye. Guess what they are catching through the ice out on the lake? Yep, female walleye. How come I don’t hear anyone complaining about that? I just realized that I am basically rambling on about nothing. Bottom line is that it is just cold out there. Bundle up everyone, it doesn’t look like it is going to get above freezing until next month. Time to go tie some more flies.